The Lake Tahoe area is one of the most popular vacation destinations in the Western United States. The region offers a wide selection of fractional ownership opportunities. Lake Tahoe rests among the mountain peaks of California and Nevada. Panoramic beauty sets the scene for winter and summer getaways. During the summer months, visitors enjoy a variety of outdoor activities including golf, boating, hiking, rafting, fishing and much more. When the weather turns colder, Lake Tahoe becomes a paradise for skiers and winter sport enthusiasts alike. The area is host to some of the most luxurious resorts in the nation. The fractional resale market in this area is booming with over a 140 residences, from studios to five-bedroom homes listed for sale on the MLS (Multiple Listing Service). This area has single family homes, lodges, luxury condominiums and hotel suites available from half shares to 1/14 shares, priced from $21,000 to $1.5m. The Tahoe & Truckee Property chart below shows a selection of the area's offerings. There are a couple of new residence clubs being developed in the Tahoe area. The Ritz-Carlton Cub, Lake Tahoe will be part of the new Ritz-Carlton resort under construction mid-mountain at Northstar-at-Tahoe. The club will have ski-in/ski-out access, ski valets to heat your boots and put them right next to the slopes. The fractional accommodation will range from two- to four bedroom residences, and pricing starts at $289,000 for a 1/12 share. 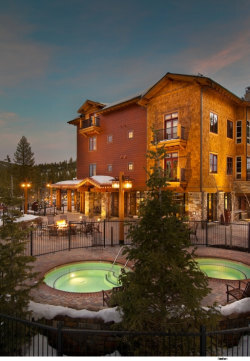 Northstar Lodge~Hyatt Residence Club opened last December and also offers ski-in/ski-out accommodation. The two and three-bedroom units range from ~1,300 to ~1,900 square feet and pricing for the fractions starts below $90,000 for a 1/20 share. The Tahoe area also has a wide array of stand alone single family homes that are available with fractional shares. The shares in single family homes tend to be larger than with private residence clubs with ¼, 1/6th and 1/8th shares as the most popular combinations. There are quarter shares in lakeside 3 bedroom homes available for up to $2,000,000. Just as in our earlier articles covering fractional sales in Vail and fractional sales in Aspen, the best way to buy or sell a fractional share is often by going through a realtor. Nearly all fractional ownership is deeded real estate and as you can see above with the large number of shares listed on MLS, it's the realtors who can give you a lot of visibility.